« Doing what they said couldn’t and shouldn’t be done! Have you heard about resistant starch? If you are a pasta/rice/potato lover then there is a glimmer of new hope – if you are happy to eat them cold! New research suggests that cooking and then cooling these carb types changes the nature of the starches that they contain. And it seems as if that change is for the better – because it transforms the starches into a form that cannot be digested, and therefore doesn’t interfere so much with your blood sugar. 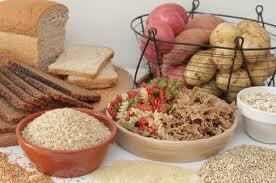 Many of the carbohydrates in our diets are starches – which are simply long chains of glucose. When we cook these starchy foods and eat them straight away our digestive systems break those chains and release glucose into our blood streams rapidly. So rapidly that we may just as well eat sugar! That soft fluffy jacket potato behaves almost like a bag of sweeties – it’s not the ‘healthy’ option it’s cracked up to be – at least not if you are thinking blood sugar balance! But not all of the starch we eat gets digested – rather it’s resistant to digestion, and it simply passes through the gut and acts like fibre. What this new research is finding suggests that letting the starchy foods go cold before eating them changes the nature of the starches and makes them more resistant to digestion. Simply put, it never gets digested into glucose, never ends up in our blood stream upsetting our blood sugar balance, and passes directly through the digestive tract into our gut. Once there it feeds the friendly bacteria in our systems, bringing about a whole host of health benefits. Many of these benefits are for the colon itself, but it now seems it also helps to reduce inflammation, and in turn improving insulin sensitivity and lowering blood glucose. BUT BEWARE – testing so far has only been done on animals, and we don’t know yet if has the same effect in humans. So before you rush to cook and cool those grains, potatoes and pastas wait for the human testing, and prepare to like your carbs cold!! This entry was written by rebalancediabetes, posted on October 16, 2014 at 8:47 pm, filed under Uncategorized and tagged carbohydrates, carbs, diabetes, diet, healthy eating, insulin, insulin resistance, starch, starchy foods, sugar. Bookmark the permalink. Follow any comments here with the RSS feed for this post. Post a comment or leave a trackback: Trackback URL.